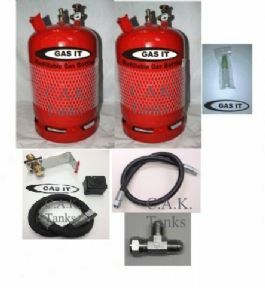 This is our comprehensive top quality GAS IT Twin 6kg Refillable Gas bottle kit for Caravans or Motorhomes with In Locker fill point system. 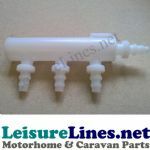 Easy install and means you don't have to drill your vehicles external body to fit a fillpoint system. 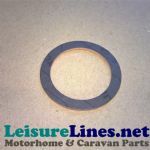 It also complies with all UK and EU requirements. This GAS IT brand of 6kg Refillable gas bottle is fitted with auto shut off 80% fill float level and a content controlled level indicator on bottle outlet valve. Bottle comes with the standard refillable inlet elbow with JIC fitting identical to our other bottles and Gaslow, Caratank etc.